The screen is divided into a main configuration screen on the left and 8 windows on the left that provide information about the connection, firmware, and other information. This window shows the link status for the ISDN line. The Link status currently shows a D which indicates that the router is synced with both SPIDS. 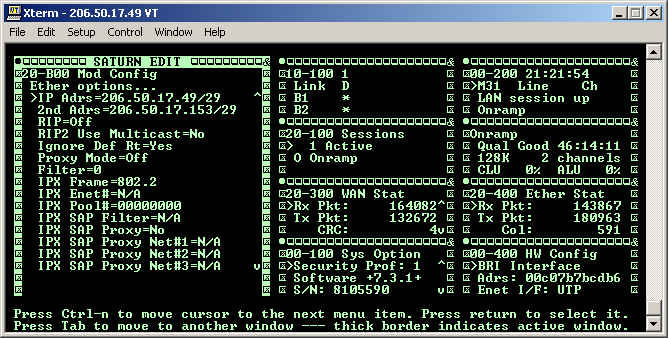 The B1 and B2 status show a * for each, which shows that both ISDN lines are connected at this time. Listed below are the different status indications for both the Link and B channels. This indicates that both SPIDS are synced with the telephone company switch. A link M generally means that the ISDN line was provisioned with only 1 active SPID. This usually indicates one several things. The switch type could be programmed incorrectly in the router or the line could be having problems. Either way, the router is seeing signal from the switch, but is unable to interpret it enough to gain full line synchronization. A link X means that the router is not receiving any signal from the ISDN line. Either the line is not plugged in or is bad, or the ISDN line is down. An * indicates that the channel is connected to the Internet. A - in either channel means that that line is capable of being connected, but currently is not. A . in the channel statuses is usually paired with a Link . or a Link X and indicates that the router is not able to bring that channel up. This shows a list of the last 32 events that occured to the router. 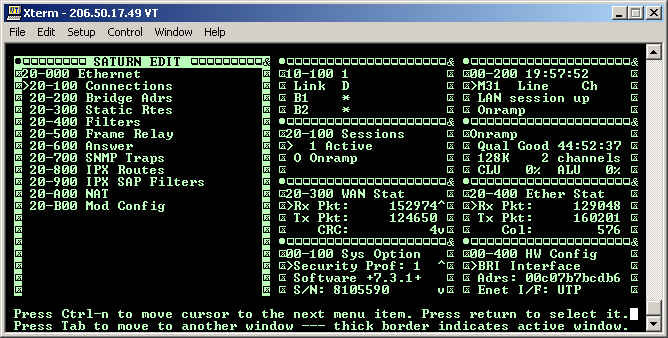 The Ascend router only has memory for 32 events, but these can be quite useful in diagnosing ISDN connection problems as the ISDN cause codes will be listed here. Listed here are the current active connections. 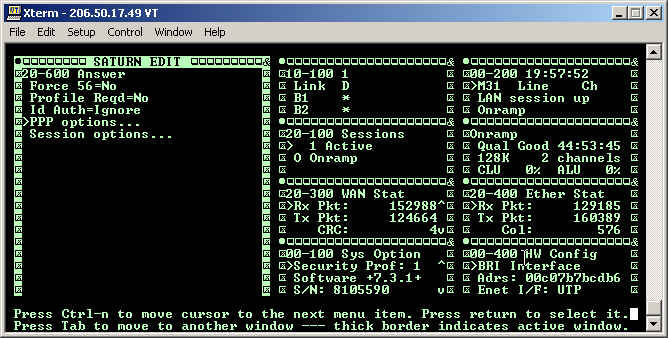 In this example, there is one connection listed called Onramp which is connected to the Internet. The Ascend Pipeline can handle multiple connection profiles, up to 16, and can have one connection for each of its ISDN lines, so more than one connection may be connected. Shown here is the amount of packets received and transmitted across the ISDN line, as well as the amount of line errors, or CRC's. If the amount of CRC's show is incrementing, it usually indicates a problem with the ISDN line. The Ethernet statistics show both received and transmitted packets, as well as the amount of collisions. As the Ethernet port is only half duplex, the amount of collisions will be higher than usual, but as long as it's lower than about 10% of the amount of packets, the network is doing fine. This window lists the version of firmware being run on the router. It also shows the security profile currently being used, which in this example is 1, or basic telnet access. Finally, the serial number is listed which can be helpful for finding the correct firmware for the router. The last window shows information about the physical configuration of the router. This router has a BRI interface. Next, it shows the MAC address for the Ethernet port on the router. Place the information listed above into the fields listed in the Configure... screen listed below. When you are complete, press the ESC key and select Save and Exit from the menu. 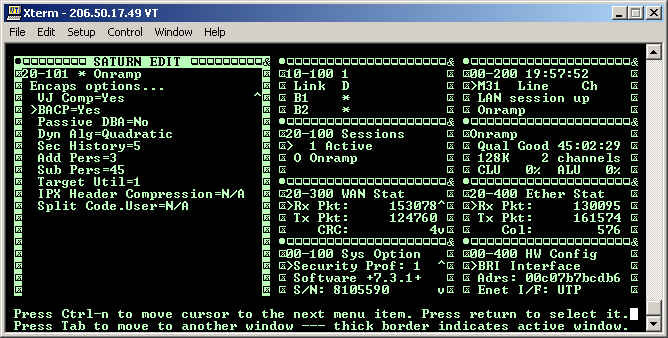 BACP stands for Bandwidth Allocation Control Protocol and allows unlike vendor routers connected to each other to dynamically control the B channel usage on a connection. This is especially helpful for customers who have to pay per minute for B channel usage and want to only use the second B channel if there is demand for it and have the channel disconnect if not in use. Choose Answer from this screen. You will then be presented with this screen. Choose PPP Options and ensure that BACP is set to YES. Without BACP being enabled here first, the BACP options in the other parts of the router will not be available. 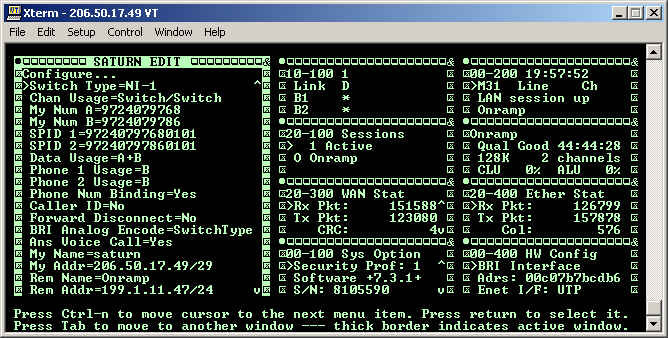 From the Ethernet menu we came from earlier, select Connections to be given a list of all the connection profiles currently configured. In almost all cases, only one connection profile be listed. However, if more than one are listed, choose the Connection profile with the * listed by it as that is the one currently being used by the router. On the Connection Profile screen, make sure that Encaps is set to MP to enable BACP on the connection. Then, go to the Encaps Options... menu listed on the screen. BACP is enabled, but it needs to be configured properly. Set the Base Ch Count to 1 if you want the router to only have 1 channel by default. Then, set the Min Ch Count to 1 and the Max Ch Count to 2 so that the router can go between 1 and 2 channels dynamically. In this example, the settings are set to 2 so that the router will always try to maintain 2 channels connected. And, because this Ascend is connected to a Cisco on the remote side, BACP is the only option available to allow a second channel to be reconnected without dropping the entire connection. Finally, the sensistivity of the second channel can be configured by modifying 4 numbers on the second half of the Encaps Options screen. The Sec History defines the sample size used to to calculate the Average Line Usage. The Average Line Usage is used to decided when the second B channel should be connected or disconnected. The Add Pers number defines the number of seconds that the ALU must be above the Target Util before the second B channel will be connected. The Sub Pers is the amount of time in seconds that the Average Line Usage must be below the Target Util before the second line will be dropped. In this example, the router will connect the second channel after 3 seconds of being above 1% ALU. Press Enter on Ether Options. The first subnet mask, that you configured from the Configure menu is listed in IP Adrs. Place the second IP and subnet in the 2nd Adrs field. Reboot the router to make the changes take affect. The key to effective troubleshooting is to verify which of these parts are working and not working by using steps that eliminate problems. Follow the steps listed below to troubleshooting the connectivity. Power cycle the router. Since the Ascend router does not have a power switch, you must unplug it and plug it back in. As the router comes back online, watch the WAN light and compare it to our chart of router lights. 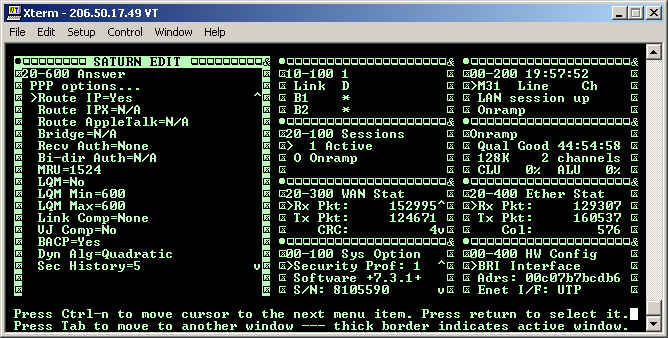 If the WAN light comes up and shows solid green, then router is successfully connecting to the Internet. The problem lies either in the customer's IP addresses or at the ISP side in the RADIUS configuration. If the WAN light remains off, then router is not connecting. This can indicate that the customer's network is not communicating with the router. Have the customer attempt to ping the router and if there is no response, then either the router is misconfigured or the network connection to the router is down for some reason. If the WAN light is blinking once about every 2 seconds, then the router is attempting to dial up to the Internet and is being disconnected for some reason. The most common cause of this is an authentication problem. You can try to dial up as the customer and see if authentication fails or you can reset the customer's password in RADIUS and make sure that the router has the correct information. Finally, if the WAN light is blinking several times a second, then the telephone line is most likely down. Ensure that the cabling between the router and wall is good and if so, then open a ticket with the telephone company. Be extremely careful when following these steps as incorrect use can result in the loss of router firmware or even the router ceasing to function. Also, make sure that you have all necessary information for a completely new configuration when you are through. The steps to take to flash a Pipeline router back to factory defaults are difficult and depend upon the model of router and the serial number it has. This process will not only flash the router, but will also clear out any passwords in the router, so if a customer has lost their passwords to the router, this is how to get into it.